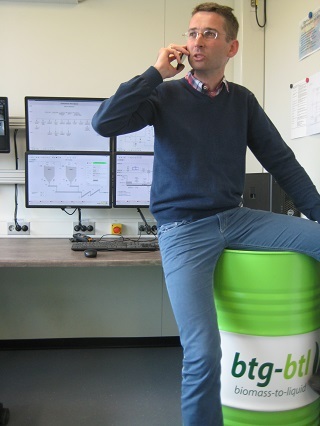 In our latest newsletter you will find an interview with Martin Risseeuw, plant manager at Empyro, on the challenges he encountered. Also included is a brief report on the official opening of Empyro and the accompanying international symposium last wednesday and thursday. We hope you will enjoy reading this issue. Voor Nederlands klik hier a.u.b. Martin Risseeuw is the new Plant Manager of Empyro. Coming from AkzoNobel, he has been indirectly involved with the pyrolysis process since 2001. Since July 2014, he, as a Plant Manager, has been responsible for the commissioning and managing of the plant. What is your history and how did you get involved with Empyro? For fifteen years I have worked for AkzoNobel, of which I worked seven years on-site in Hengelo and four years as a Power Plant Manager in Delfzijl. 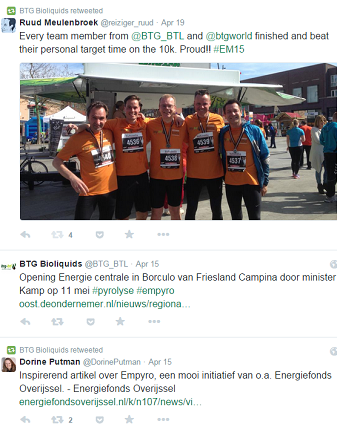 After my time in Delfzijl, I have been seconded at BTG-BTL for one year in order to set up the Empyro project. After that I have been responsible for the major energy contracts of AkzoNobel in the Netherlands. I have done this for three years and nowadays I am the official Plant Manager of Empyro. I have been involved with the pyrolysis process since 2001. AkzoNobel wanted to become more sustainable and we opened a study on the opportunities for greener energy supply. One of these opportunities was devoted to pyrolysis oil. However, we were too early at the time. I became involved with the project once again, as soon as the Empyro plans became more concrete. This was during the engineering and licensing phase. What is your feel about managing the Empyro when you compare this to your previous work experiences? At AkzoNobel everything is already planned and organized. 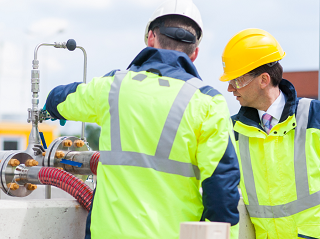 As a Plant Manager or Manager you have access to specialists of all areas. We do not have those people at Empyro. When I started this project, I had to figure out in what way I wanted to lead the organization in the right direction, whom did I have to contact for answers on which questions? Eventually, you end up doing everything. For example, the sowing of the grass had to be controlled as well. You need a temporary office building and this needs to have furniture. You need to arrange spare parts for the plant. Everything just needs to be done. To me personally, it is a very nice way to learn a lot. We started with a piece of paper and a laptop, and right now there is an actual pyrolysis plant. This can all be attributed to collaboration. What has been the major challenge for you with regard to Empyro? Our challenge has been to make the plant produce pyrolysis oil as soon as possible in a reliable and efficient manner and to figure out how this could be achieved with a small team. We are a small organization that has to achieve a lot. The operators are also maintenance technicians and that requires a lot of adaptability of people. The beauty about this position is to pioneer! You will encounter the same technological challenges in other positions, but creating a complete picture makes the difference. The plant belongs to us all. The men also feel it in that way. Together we are building something great. How are things at Empyro currently? We have tested the facility from mid-January 2015 till mid-March after the construction was completed. Then there finally was the first oil. Obviously, we still have some problems to solve. On the other hand we are very busy with organizing the future. A very important step was receiving the NTA8080 certificate in February. This certification is necessary in order to allow us to make the use of pyrolysis oil at FrieslandCampina eligible for the SDE subsidy. 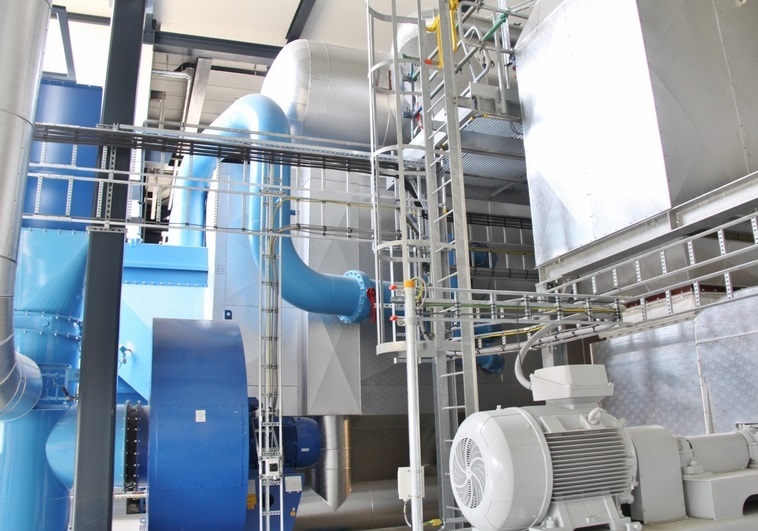 With this we can demonstrate that the entire pyrolysis chain is sustainable and reduces at least 50% of the CO2 emissions when compared to the combustion of natural gas in FrieslandCampina’s boiler. We achieve a 90% reduction and we will celebrate another milestone with the official opening of Empyro this week. How do you see in the future of BTG-BTL and Empyro? Right now, the plant still requires a certain amount of subsidy. That is fine, there are more sectors in which that happens. The total balance has to be right. Pyrolysis oil alone is not the solution to our energy problem, but I envision a great future for pyrolysis oil as a solution for replacing fossil fuels in the chemical industry as a raw material substitute. In my opinion the future of pyrolysis plants can be found in biomass rich regions. The strength of BTG-BTL can be found in the people who work there: perseverance, determination, creative solutions and responsiveness are their strengths. In addition, they are the experts in the field of their technology. With regard to pyrolysis they are way ahead of anyone else. 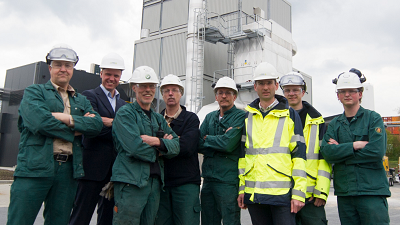 Martin Risseeuw: “We started with a piece of paper and a laptop, and right now there is an actual pyrolysis plant. This can all be attributed to collaboration”. During a festive meeting on May 11, Minister Henk Kamp for Economic Affairs started the sustainable energy supply for the new production site of FrieslandCampina Domo in Borculo. Roelof Joosten (FrieslandCampina) and Gerhard Muggen (BTG-BTL & Empyro) received the NTA 8080 certificate from Jorn Bronsvoort of the certification company QA Testing. The NTA 8080 certificate demonstrates the sustainability of biomass for energy, fuels and bio-based products. 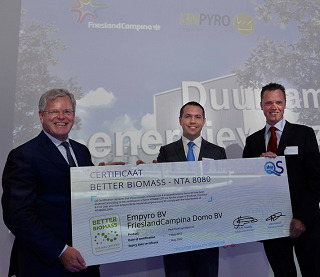 With this certificate both FrieslandCampina Domo in Borculo and Empyro have guaranteed the sustainability of the use of the pyrolysis oil for heat production. The certification system is recognised by the European Commission to demonstrate compliance with the European sustainability requirements for biofuels which are set out in the renewable energy directive (2009/28/EC). NTA 8080 is also mentioned in relation to sustainability criteria for solid biomass energy as part of the Energy agreement of the Dutch government. At the opening of the Empyro plant the website PyroKnown has been unveiled. PyroWiki: all relevant information about pyrolysis is shared in this wiki. PyroWebinar: webinars about pyrolysis and related projects. PyroMovies: movies about all aspects of pyrolysis such as production, use, and application. 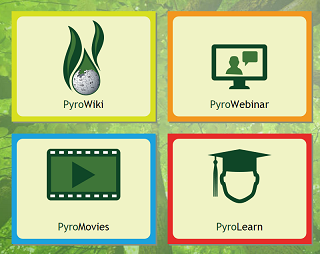 PyroLearn: In this section, courses about pyrolysis can be followed. Exactly one year after the construction of the pyrolysis plant Empyro started, the plant’s festive opening took place on Wednesday May 20th. In the morning guest speakers from the Province of Overijssel and the Dutch topsector policy program explained how they view pyrolysis technology: as a foundation for the biobased economy of tomorrow. Afterwards all visitors were shown around the Empyro plant, which was then officially opened. The rest of the day our guests listened intently to presentations on the realization of the Empyro plant and the sustainability of pyrolysis oil. FrieslandCampina Category Procurement Manager Tim Schröder (image above, on the right) explained what had motivated them to opt for pyrolysis oil . The next day the Empyro symposium hosted speakers from around the world on all aspects of pyrolysis oil. Around 100 guests from 15 countries were captivated by the latest developments in pyrolysis oil productions, standardization and application for heat, power and transport fuels. 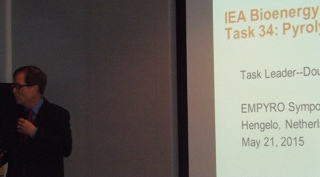 From the USA Dr. Doug Elliott of Pacific Northwest National Laboratories gave an overview of the role of IEA Task 34 in coordinating pyrolysis developments around the world (image above). 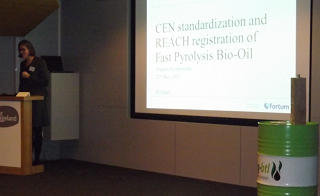 Pia Saari from Finland works for Fortum, the major Finnish heat and power provider, and is coordinating the standardization of pyrolysis oil in Europe under CEN. One of the highlights of this symposium was the presentation of Mr. Marlon Almeida, senior researcher at the Brazilian oil major Petrobras. He shared the results of the research program which Petrobras has started several years ago into the use of crude pyrolysis oil at oil refineries. His group has managed to demonstrate that it is feasible to co-process crude pyrolysis oil in existing oil refineries into gasoline and diesel. 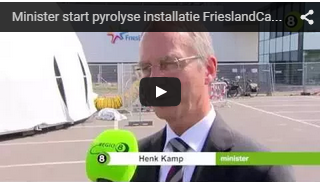 A newscrew from the local television RTV Oost reported on the opening of the plant. We are happy with the way the opening and the symposium turned out and we wish to thank all those that were present! During the Empyro opening symposium on May 21st in Hengelo we received guests from 15 countries? The first batch of oil that Empyro produced already met our quality specifications? This first oil has been bottled into 100 individually numbered bottles? FrieslandCampina started building a new production site for milk powder and high-grade ingredients for children’s foods in Borculo in 2013. The production site has a processing capacity of 750 million kilos of milk. FrieslandCampina wants to grow on a climate-neutral basis. 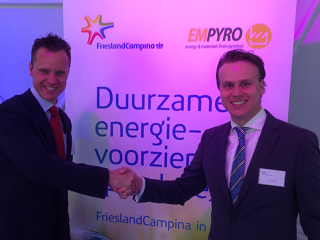 Nearly all pyrolysis oil produced by Empyro in Hengelo will be used to fuel FrieslandCampina's new production site in Borculo. The boiler at FrieslandCampina that operates on both pyrolysis oil and natural gas . By choosing renewable pyrolysis oil, the entire production site’s direct carbon emissions will fall by 15 percent, resulting in a considerable reduction in the use of fossil fuels (10 million m³ of natural gas and 16,000 tons of carbon emissions annually, which is comparable to the carbon emissions caused by nearly 2,000 Dutch households). 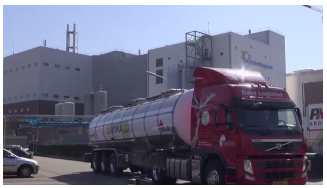 What is more, the energy consumption of the new site will drop by 20 percent compared to that of other FrieslandCampina sites thanks to energy saving techniques. Dutch minister of economic affairs Henk Kamp started up the new factory on monday May 11th. Today we released our short video on BTG-BTL. 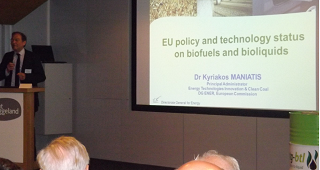 Wednesday 3 june BTG will give a presentation in Vienna on Empyro during the 23rd European Biomass Conference (EUBC). 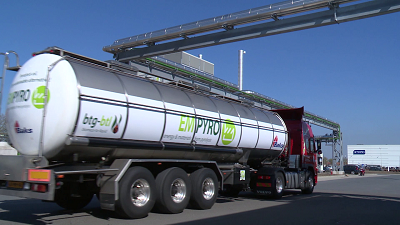 September 2015 we release our short video on the pyrolysis process at Empyro. To demonstrate pyrolysis technology on a commercial scale the Empyro project is financially supported by the 7th Framework Programme of the European Commission (Grant number 239357), by the Dutch government via the topsector Energy: TKI-BBE and by the province of Overijssel via the Energy Fund Overijssel.